None of the participants in the Sparrow Quartet typically have approached their art in a straightforward manner. Although the traditional folk and bluegrass styles in which they have been schooled long have formed the bases for their pursuits, banjoists Abigail Washburn and Bela Fleck, cellist Ben Sollee, and fiddler Casey Driessen have preferred instead to carry their works as far afield as possible. Whether it is produced on the stage or in the recording studio, their output has been adventurous and deliciously unorthodox. Although there undeniably has been some variance in their rates of success, they also have never failed to offer some surprising twists and turns as they have broken down boundaries in their seemingly never-ending quests to explore uncharted terrain. Spurred by Washburn and produced by Fleck, the Sparrow Quartet’s self-titled, full-length debut undeniably is a fascinatingly quirky affair. Rather than beginning with a whirling square dance, the collection opens with a series of song snippets that have been strung together and given the apt title of Overture. Its kaleidoscopic architecture initially is quite disorienting to unsuspecting ears. As the set progresses, however, the shifting colors and patterns that are evoked by the band begin to congeal into sharply drawn images of Appalachia, the Deep South, the Far East, and Carnegie Hall. Overture, it seems, isn’t simply an indication of the implications that lie behind the Sparrow Quartet’s name; it also provides the key for comprehending the endeavor. Classical music, of course, commonly is considered to be a thing of the past. Even newly composed symphonies largely adhere to frameworks that were established centuries ago. With its self-titled debut, Abigail Washburn & the Sparrow Quartet has illuminated a path toward the genre’s future that is as strange as it is conceivable. Although the outfit has employed bluegrass-oriented instrumentation, the resulting music falls almost entirely into the sort of structural design patterns that are akin to orchestral scores. There are folk, blues, bluegrass, and gospel shadings to the songs, and there’s plenty of room for the instrumentalists to unleash strings of notes that flit wildly about. Yet, there also are tremendous amounts of organization and discipline to the arrangements. 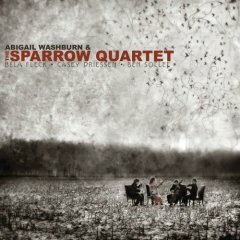 Surely, it isn’t an easy task to find the right, cooperative balance between these two aspects of a performance, which is why, while listening to the Sparrow Quartet’s eponymous outing, it soon becomes apparent that Washburn, Fleck, Sollee, and Driessen were destined to work together. Although it’s possible to hear the disparate strands of their solo projects drifting through the endeavor, the music that results from their full-fledged collaboration exudes the air of a unified vision. The collective adds a weird, haunted, and decidedly ominous air to the fringes of Strange Things, and it lends a dramatic — almost operatic — flair to cuts like Great Big Wall in China. On the subsequent Taiyang Chulai, Washburn delivers her lyrics in Mandarin Chinese, and although this is a feat that she previously tried on Song of the Traveling Daughter, it unfolds so much more naturally in the hands of the Sparrow Quartet that it’s hardly a surprise when she begins to sing in another language. What is, perhaps, most amazing about Abigail Washburn & the Sparrow Quartet’s eponymous endeavor is how well developed and fluid the ensemble’s chemistry is. Given the material’s underlying construction, it goes without saying that the music is sophisticated. Yet, despite their intricate arrangements, none of the songs feel overly erudite, nor do they ever come across as stuffy. Without a doubt, the album is challenging, but it also is highly approachable. In the end, this duality makes the outing utterly transfixing and endlessly rewarding.